We have just under five  weeks to go to blast off. Part 1 of the Cosmic Cal will be published on Tuesday 17th April 2018. It is so much fun, watching you all choosing your colours, making colour boards, and ooooohing and ahhhhhing over the colours that others are choosing. And… now that all the yarn packs are on sale, both in high street shops, and the online stores, you will soon be excited about your squishy purchases. There have been lots of questions asked, especially in the Stylecraft Cosmic CAL Group (Official). Most of the answers are in the group files or in the intro post on my website, so please take a read of them, so that you are up to speed with all the details. This post is to give you a little more information, especially about tension and gauge when working with the Stylecraft yarns. ♥ Ensuring you have the correct tension and gauge will mean you have plenty of yarn in your pack. 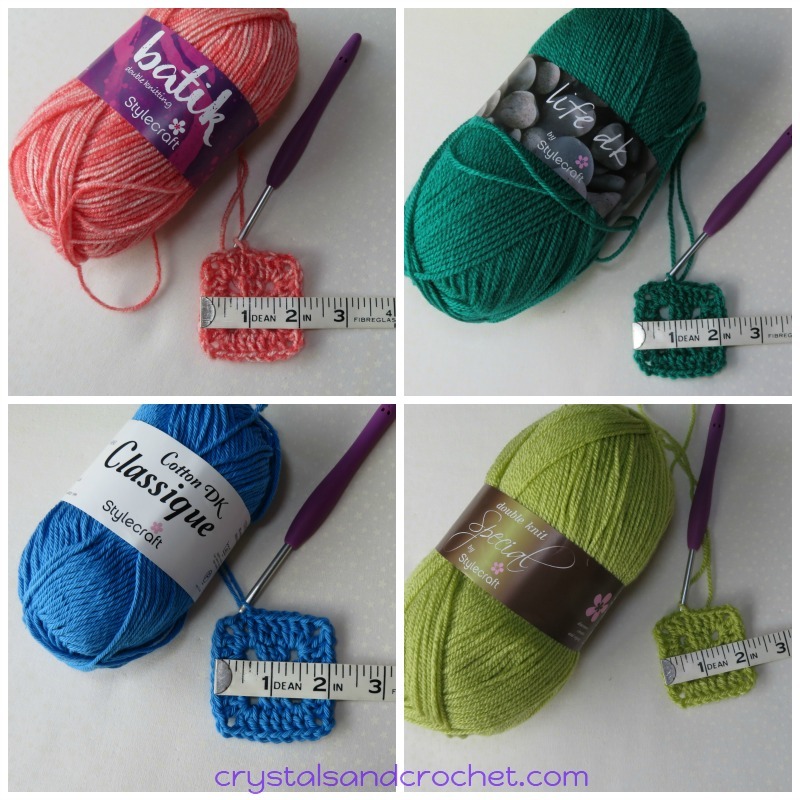 ♥ Once you have your chosen yarn, make a tiny square as shown below. ♥ For all DK [double knit] yarns use a 4mm/G hook. If you would like to learn more about tension, and how to perfect yours, please take a look at this post Talking Tension, and there is a video to help you. Please note all my video tutorials are in US terminology. Join to 3rd ch with a sl-st.
Stitch count: per side: 3 dc/tr, 1 ch-2 corner space. Stitch count: per side: 7 dc/tr, 1 ch-2 corner space. Squares made with Aran yarn and a 5.5mm/I hook will measure 2 ½ inches/ 6.35cm across. If your square is smaller, try again with a larger hook size, .5 to 1 mm larger. If your square is larger, try again with a smaller hook size, .5 to 1 mm smaller. Next question…… Can I do this? The simple answer is YES, anyone will be able to do this. But if you would like to test your skills, before we start, then have a go at Sweet Caroline. This was a mini cal at the end of last year, there are three  parts, all with photo and video tutorials, and will give you a great insight as to how I work, both with pattern writting and my video tutorials. How long will each part take me? Firstly, this is not a race, go at your own pace, enjoy every stitch you make. Some people will have all day to sit and crochet, others will be lucky if they get one hour in the evening. I tried to split the parts up to take around 8 hours, but again we all hook at different speeds, and when you are working on new stitches, that you have not done before, it will take a little longer. Again the video tutorials are very detailed, so don’t worry I am there to take you through every detail. How will I know which colour to use when? With part 1 there will be a downloadable pdf which details the colours used per round, for all four yarn packs. If you have chosen your own colourway, all you need to do is decide which colours you are swapping for what, and then make your own list. Here is a pdf to help you, print it off, and keep it handy for week one. All of the other information you will need is either in the Intro post, or will be included with each part of the pattern. Your color combos are incredible!! Has anyone used mostly a different color for each round as a way to use up yarn in their stash? If so is there a pic? I an new at CAL. Where do I find this pattern in full, I just stumbled upon this so I am way late. I assume this is finished. I have never done a Crochet Along before. Morning Helen, where can I download the whole pattern? What gauge measurement should I have if I choose to use worsted weight yarn? Working on Sweet Caroline. I’m in love. Thanks for stretching my mind and ability. I have seen a page showing the usage in meters. But I cannot find it again. I ordered the Love and Light kit and a 5.5 mm hook. I received part of my yarn today and did the sample and I am spot on! Thank you for your help. Now I can rest easy. Thank you so much for this! I was wondering where I stood! I used some color crafter to see… I’ll be using a 5mm hook and I’m just barely below where I’m supposed to be. I’m doing the pastel colors and am so excited to start! This is so helpful, what a great idea for people who are changing out the colours but also if not to keep track of which colour for the right round. Think it’s great……. thank you Helen. 1 inch is 2,54 cm.